The White House, statehouses, and nonprofits backed by the billionaire Democrat Tom Steyer worked behind the scenes to create a state-level advocacy network to support controversial new Environmental Protection Agency regulations, newly released emails reveal. Involved in the strategy was a top aide to John Kitzhaber, the former Democratic governor of Oregon, according to emails obtained by the Energy and Environment Legal Institute. Kitzhaber resigned this year in the midst of a scandal involving his fiancée. E&E released its findings in a Monday report that shows extensive behind-the-scenes coordination between White House staff, aides to as many as 12 governors, and officials at multiple arms of Steyer’s network of political and policy groups. "Our report pulls the curtain back on a carefully planned and heavily funded ‘orchestration’ by individuals who have placed their personal interests ahead of the public interest," said E&E senior legal fellow Chris Horner in a statement accompanying the report. Horner and the E&E team obtained the emails through state and federal Freedom of Information Act and open records requests. According to the report, "some of these requests remain outstanding due to slow-walking and outright stonewalling by offices in California, Kentucky, and Virginia," meaning the extent of the behind-the-scenes collaboration on this EPA strategy could be greater than the report reveals. Efforts to sell EPA’s regulations at the state level are important given the controversy surrounding the agency’s final rule, released this month, which relies on states to meet EPA’s emissions reduction thresholds. The strategy to win support for the regulation, which critics call onerous, began in late 2013 when aides to Kitzhaber, Oregon Gov. Jay Inslee (D.), and California Gov. Jerry Brown (D.) opened talks with the White House regarding EPA’s regulations of carbon emissions from power plants, which were being drafted at the time. Emails in December 2013 dub the plan "Dan’s concept." That is a reference to Dan Carol, a former Kitzhaber campaign operative and then the highest paid member of his administration. Carol got that job after he landed a fellowship at the Clean Economy Development Center for Cylvia Hayes, Kitzhaber’s fiancé, even as she acted as an informal adviser to the governor. Carol was a central figure in the ensuing scandal that in February forced Kitzhaber to resign. Internal communications described White House meetings on Carol’s "concept" as "a useful and frank discussion about how a group of engaged Governors (not just from the West) could work with the WH on transformational multi-state work around 111d regulatory challenge, sub-national climate action, resilient infrastructure outcomes." Around that time, Carol was meeting with Dan Utech, the special assistant to President Obama for energy and climate change, and Rohan Patel, the White House’s deputy director of intergovernmental affairs, emails show. He was also working to recruit Steyer as the figure who, with his deep pockets and established political infrastructure, could unite disparate state and federal administrators, and infuse the effort with the political, policy, and business backing needed to sell it to a skeptical public and their elected representatives. 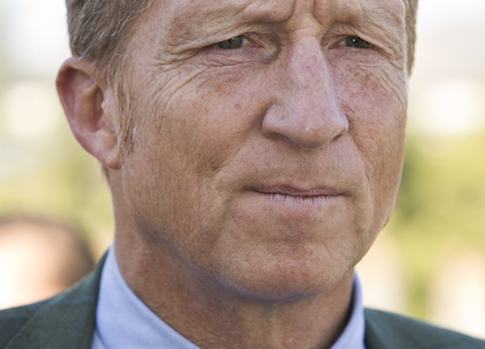 In January 2014, Carol emailed Ted White, the managing partner of Fahr LLC, which White’s law firm describes as "an umbrella entity for prominent investor and philanthropist Tom Steyer’s extensive business, policy, political, and philanthropic efforts." Carol suggested that Steyer meet with key players behind the public relations campaign. "Tom seemed interested in learning more and he could be a great catalyst and leader here if he was able to be in town then," Carol wrote. "I will get this information to Tom’s scheduling team (at Fahr) so we can try to block time for him," White replied. Steyer and White were already in touch with Kitzhaber and his top aides. In July 2013, emails show, the two lunched with the governor, his fiancée, and his chief of staff Curtis Robinhold. On July 30, Graham Richard, the CEO of Steyer’s Advanced Energy Economy (AEE) group, told Robinhold in an email, "Our AEE team stands ready to assist you and the governor." A month later, Carol provided Kitzhaber and Hayes with "a planning timeline that staff is using to promote strategic alignment around the various Steyer entities," according to an email released by the governor’s office. The document, titled "West Coast Alignment Planning Timeline," detailed ways in which the governor’s office hoped to work with Steyer’s network. One action item dated for October 2013 described AEE’s involvement: "Washington and Oregon leads work with AEE team to identify specific ‘business-led’ advocacy campaign elements in the region pegged to planned actions." White’s email to Carol further indicates that Steyer’s team was already devising plans for his involvement in a multi-state effort backing EPA’s power plant rule, known as 111(d). "Tom’s office (Fahr LLC) is currently determining which of the affiliated groups that we founded and fund (such as Next Gen Climate Action, or Next Generation, or AEE) will be taking the lead for us on this (or it could be a combination)," White told Carol. Two weeks later, Carol sent White a confidential strategy memo that he had shared with the White House on developing this multi-state plan. "The WH has responded positively," he said. Carol also detailed his envisioned role for Steyer in the process. "In a perfect world, Tom, [former New York City Mayor Michael] Bloomberg and [former Treasury Secretary Hank] Paulson would meet with [former White House climate advisor John] Podesta, Utech and a six pack of engaged Governors (west coast, east coast, Midwest) to cement a new strategic paradigm for maximizing state climate linkages and funder investments on the road to Paris 2015," he wrote. Carol and others involved in crafting this state-focused strategy said that the environmental left was too focused on federal-level messaging. Pushing states to implement the measures needed to comply with the rule in the face of political opposition at the state level would require a different approach—one that Steyer could spearhead. "Tom could frame and catalyze this new, smarter paradigm at low cost by funding new ‘state leads’ in WA and OR as described below," Carol wrote to White. "The alternative we fear is misallocation of resources to the usual national NGO players without a higher level of accountability that only engaged Governors and this new campaign framework will provide." On the same day, Carol emailed Podesta, now chairman of Hillary Clinton’s presidential campaign. In the email, Carol outlined his plans for "the creation of a nimble network of already engaged Governors and designated state coordinators closely tied to each Governor." The Steyer network became more involved in late March when it selected someone to manage its role in the strategy. Dan Lashof, the incoming president of NextGen Climate America, Steyer’s 501(c)(3) policy group, "will be your contact regarding our multistate policy efforts," White told Carol. By April of 2015, Carol’s "nimble network" was coming into being. In an email to AEE senior vice president of government affairs Michael Woolf, Carol identified aides to the governors of Washington, New York, Maryland, Hawaii, New Hampshire, Vermont, Illinois, Minnesota, Virginia, and Kentucky as participants. Kentucky’s presence on that list is of note, says Christopher Horner. Even as Gov. Steve Beshear, a Democrat, publicly criticized EPA’s power plant regulations as "disastrous," the director of the governor’s Washington, D.C., office was listed as a point of contact for Carol’s multi-state strategy. When the Washington Post reported on state efforts to meet EPA’s new emissions reductions standards, it quoted Woolf and Kentucky’s energy and environment secretary, both of whom said that the state could meet those new standards. However, neither the Post nor its readers could have known that Woolf and Kentucky’s governor were involved in behind-the-scenes efforts to make EPA’s regulations more politically palatable. An April 2014 draft of Carol’s plan identified Kentucky as one of five "states [that] have Governors or candidates that can’t commit to the GCC publicly now but would welcome quiet engagement." The others were Arkansas, Pennsylvania, Colorado, and Tennessee. Carol’s strategy included plans for getting Republican-governed states on board by enlisting utilities to pressure them into acquiescence. "Need the Midwest and flyover states," as he put it in one email. "Because there are key utilities whose service territories cross red and blue states, Governors in these states could quietly engineer a breakthrough strategy that compels utilities in key red states to lead the charge to win over a key Governor, rather than rely on a standard NGO-shaming strategy that might not deliver," Carol’s plan explained. Those efforts show that the plan’s architects recognized the unpopularity of the regulations they were working to facilitate, E&E says. "This counsel reflects awareness that this campaign, which the planners also recognize would cost many millions, was in support of an agenda that voters do not support and therefore must not be confronted with prior to making their decisions at the polls," the group says in its report. This entry was posted in Issues and tagged EPA, Regulation, Tom Steyer, White House. Bookmark the permalink.